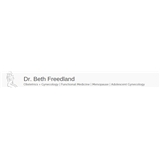 Beth Freedland, DO (Boca Raton) - Book Appointment Online! We are committed to deliver personalized high quality Obstetric and Gynecology services with respect, concern and understanding for women at every stage of their lives. Devoted to provide a clean, pleasant, and comfortable environment for all our patients. Respect to all of our patients and their families. Complete personalized woman care at all stages of life. It is our mission to serve the women of Broward and Palm Beach counties with their OBGYN needs with the latest in advanced skills and training, along with a degree of compassion and clinical experience. She was great and the staff was very professional and polite.